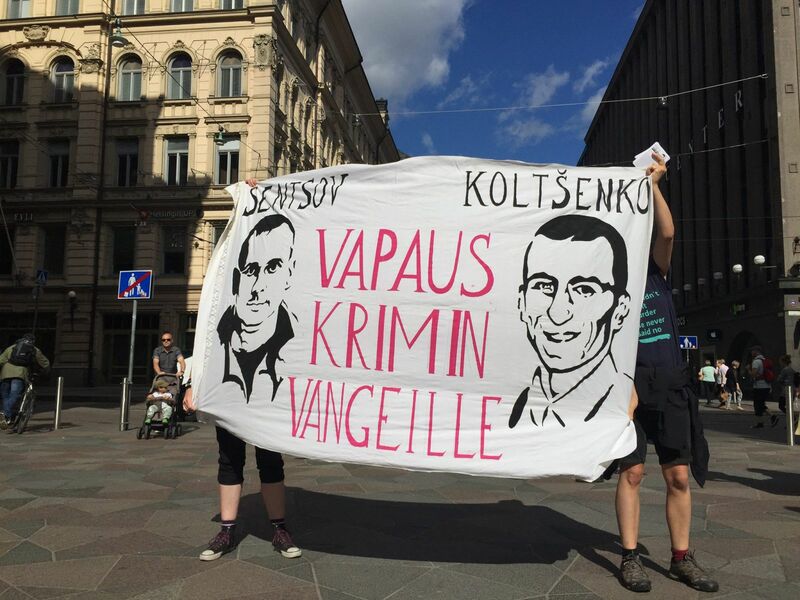 Today, Saturday the 29th August 2015, we participated in the international solidarity week and went around with few people in Helsinki demanding freedom for Aleksander Kolchenko and Oleg Sentsov, who got really long prison sentences few days ago. 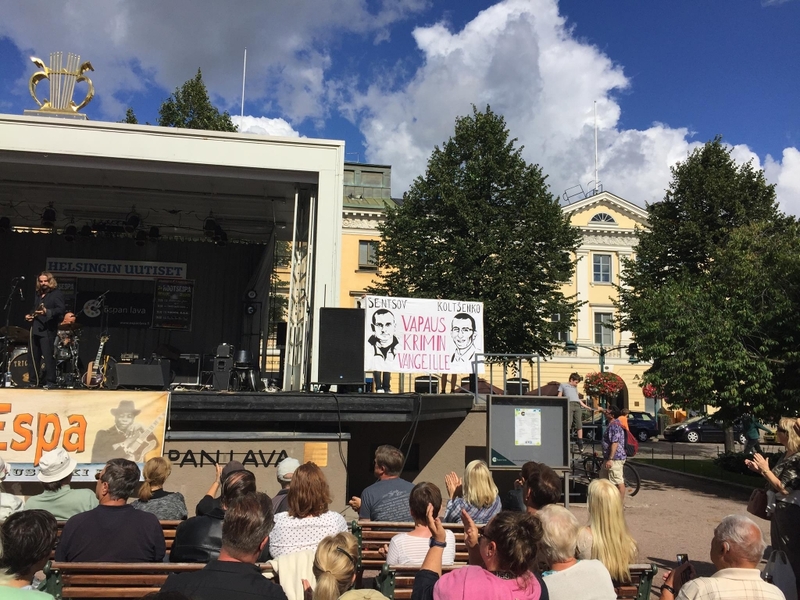 Below the text from our leaflets, which we were spreading in Finnish, English and Russian. 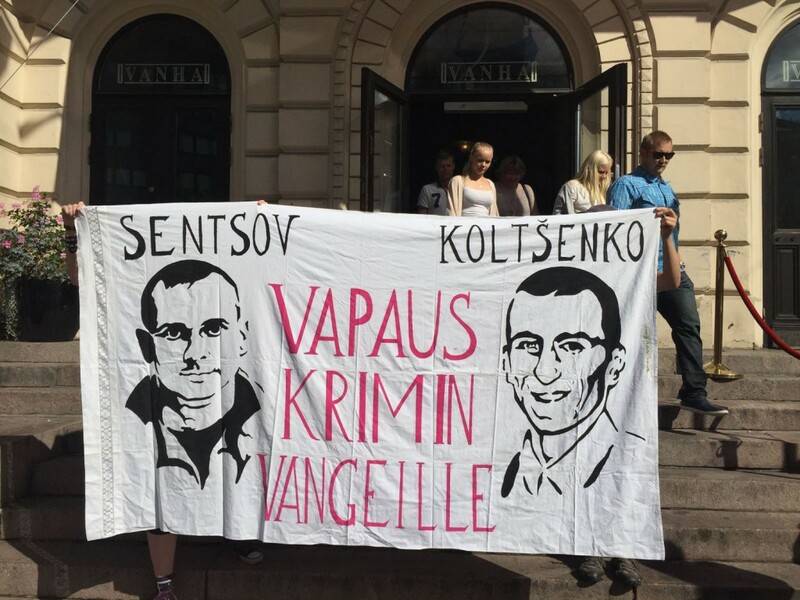 Alexander Kolchenko is sentenced to 10 years and Oleg Sentsov to 20 years in prison. They were both charged with committing ”acts of terrorism” and ”belonging to a terrorist community”. 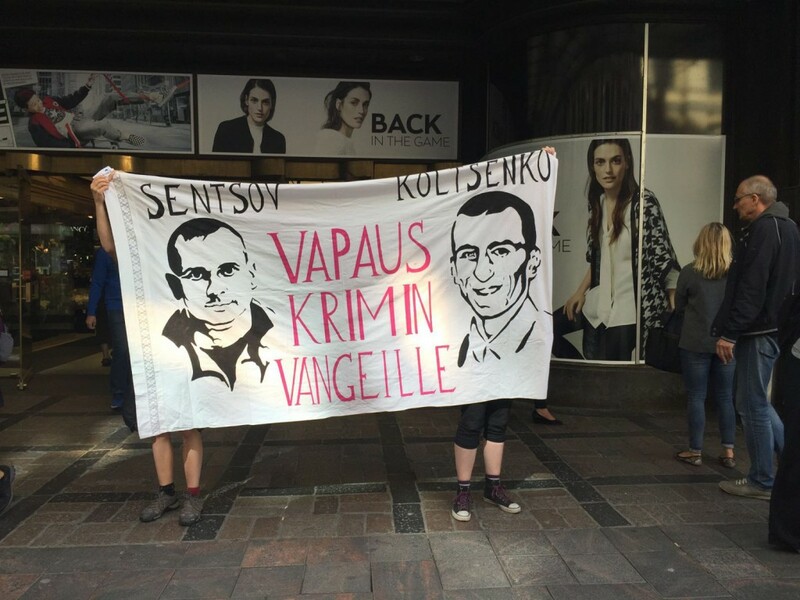 Kolchenko, a Crimean anarchist, social activist and antifascist was kidnapped by the Russian FSB (ex-KGB) along with other Crimean activists and held as a political hostage in Lefortovo jail in Moscow up till now. Alexander has undeniably proved his antifascist stance over many years, but faced preposterous accusations of belonging to “Right Sector”, a radical Ukrainian right-wing organization, whose real role in Ukrainian events is blown out of proportion by Russian official propaganda. 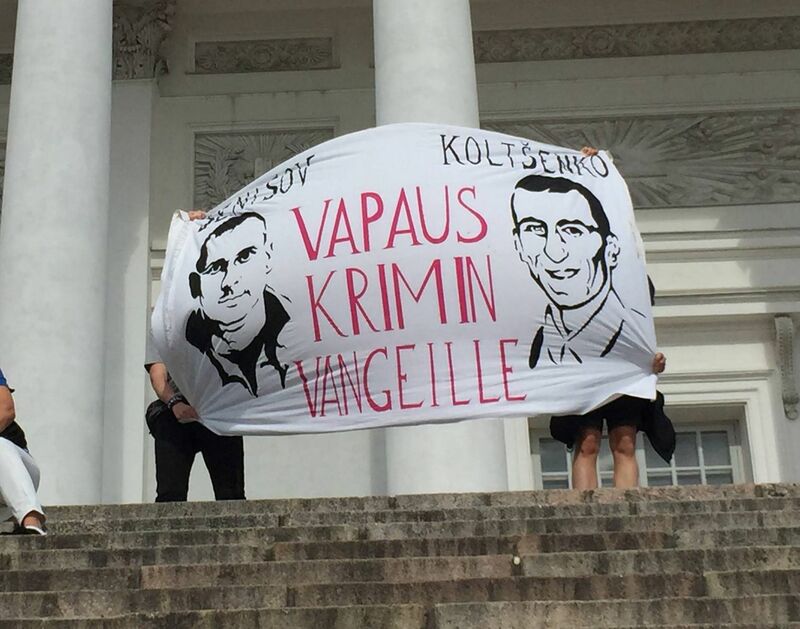 The case against antifascist Alexander Kolchenko and civil activist and film director Oleg Sentsov (investigators enrolled them into the same ”terrorist” group) is political. The whole case is considered to be part of the Russian campaign to take over Crimea, which includes repressions against anyone who doesn’t comply with the new authority. It is meant to intimidate inhabitants of Crimea, prevent any resistance on the peninsula. Many people were obliged to leave Crimea because their life and freedom were threatened. It is important to spread information about this case. We need to dissociate ourselves from any forces that support aggressive expansion of Russian nationalism, even if they cover it up with “leftist” and “anti-imperialist” rhetoric. 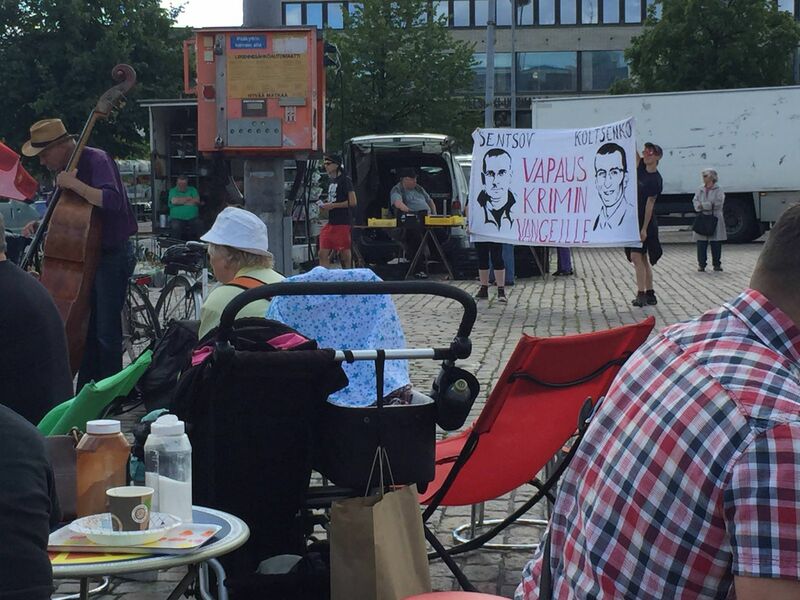 Putin’s regime is doing just fine without your sympathy, better save it for those who have become its victims.